With close to 200,000 views on YouTube, CBC has named second-year student Patrick Godfrey's french horn cover of OutKast's hit "Hey Ya" one the most fun stories in the Kitchener-Waterloo region in 2014. In September Godfrey’s video was seen by SPIN magazine, based out of New York City, who posted a link online. The video quickly became a viral sensation with the video being shared all over social media. 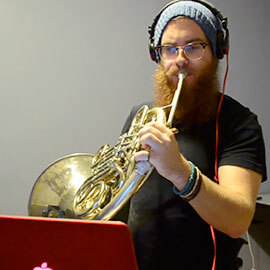 One of the best things about life in Laurier’s Faculty of Music is the passion for music that students have outside of their day-to-day studies, which is when they can often find creative outlets like Godfrey has shown. You can watch Godfrey’s rendition of OutKast's "Hey Ya" on YouTube.